This is an age old favorite which has seen changes in its recipe over a period of time. Presenting to you the contemporary method as well as the original recipe of the famous Baigan ka bharta. Stuff garlic pods into the Brinjal. Place it directly over the flame and burn. Turn the brinjal till its cooked from all sides. Once done, turn off the heat and allow the brinjal to cool. Peel the skin and mash the inner pulp. Heat oil. Add Jeera, green chillies, onions and fry for a minute. Add grated ginger and fry for a few more minutes. Add chopped tomatoes and continue to fry till the mixture leaves fat from the sides. Add dhania powder, mirchi powder, haldi powder and jeera powder. Mix well. Mix in the mashed brinjal and cook till the mixture comes together. You can add 1/2 teaspoon of garam masala also but please be careful as the dish already contains green chillies and should not become too spicy. You can burn a small piece of coal over the flame, keep few cloves on it and pour a tablespoon of ghee on it. Place this fuming coal in the middle of the bharta and cover the lid. This will lend an enchanting coal flavor to the bharta. You just have to try this one! For some reason the Original Baigan ka Bharta recipe got tampered with, over time. 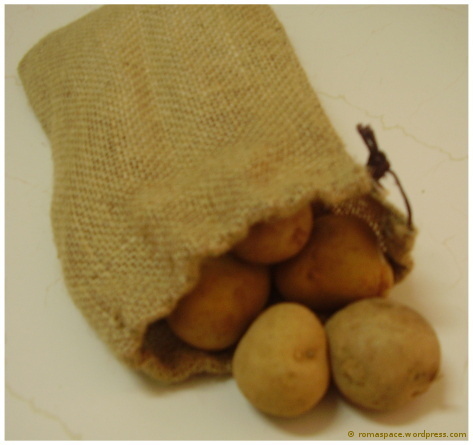 The influence of methods used to cook other vegetables was probably the reason for this. 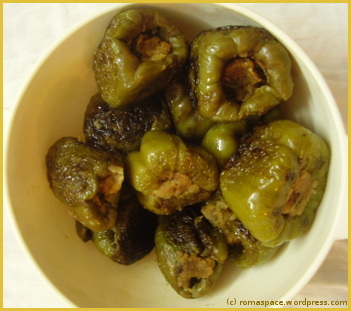 In olden days the brinjal was burnt over coal, seasoned without any further cooking and consumed. Follow first 3 steps in the procedure mentioned previously. This will give you the burnt brinjal pulp. Roast jeera seeds and powder them with the help of a mortar-pestle. Take a few teaspoons of mustard oil. Add finely chopped green chillies, onions and roasted jeera powder to it. Mix in the burnt brinjal mash and some salt. In the original recipe the mustard oil used is not heated. Yes, we are actually mixing in chillies and onions raw! Well, so much for the original recipe. 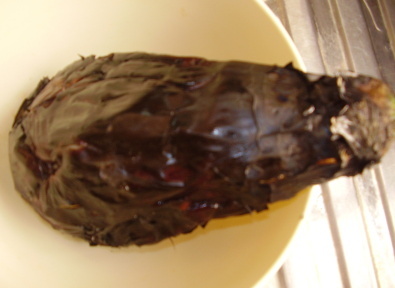 This is sabzi where baby brinjals are cooked with bharva or tawa masala. 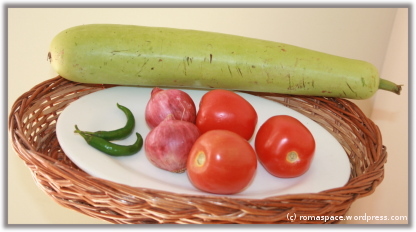 Of all the tava vegetables, Brinjals taste the best. Even people who usually dont eat brinjals go for at least a couple of pieces. For one, the dressing completely complements its regular taste. Make a cross – shaped incision on the head of the brinjals. 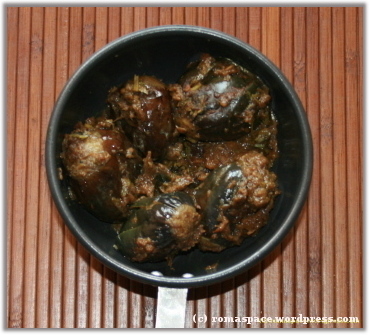 Stuff brinjals with Tawa masala using a knife. Heat oil. Fry onions till they turn glossy. Add ginger-garlic paste and continue to saute. Now add dhania powder, haldi powder and stir for a few seconds. Gently drop in the baby brinjals into the masala. Cover and cook until brinjals are done. In the above recipe sometimes we skip adding amchur powder to the brinjals and instead fry tomatoes with onions in Step (3). This gives a slight change in taste. Taste your tawa masala and check if it contains salt. In case it its without salt, please add some before stuffing the brinjals. At home we usually prefer low-oil cooking. So when we make this dish instead of frying the brinjals in too much oil we add 1/2 glass of water and pressure cook them. This is done in Step (6). 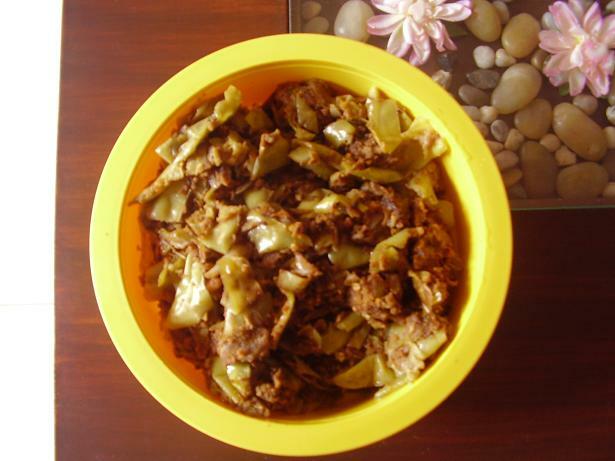 This is a simple recipe to enhance the taste of bitter gourd. Please try to use baby bitter gourds for this recipe. Peal the skin of the bitter gourd to the extend you like. Slit and de seed the gourd, rub salt on the insides and let it rest for a few hours. In case you are using baby gourds then you need not marinate it for that long as they wont be very bitter. Wash away the bitter saline water. Cut the gourd into semi-circular slices. Heat oil and shallow fry the gourd slices. Once done, take out the slices and in the remaining oil add haldi powder, mirch powder, dhania powder and hing. 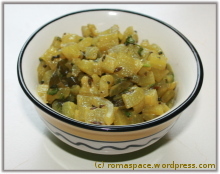 Stir for a minute and mix in the fried gourd pieces. 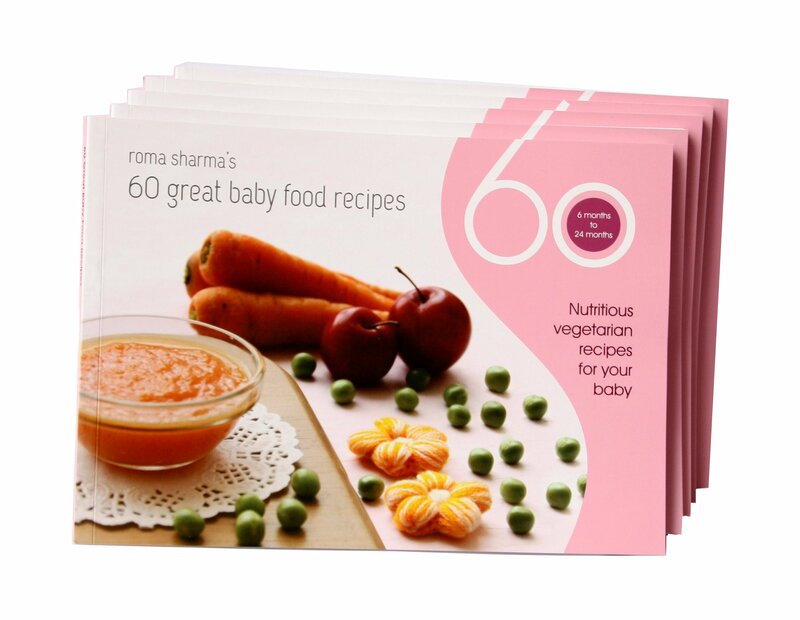 Mix well, garnish with coriander leaves and serve hot with rotis. This is by nature one of the tastier gourds as compared to bottle gourd, bitter gourd and its other gourd counterparts. 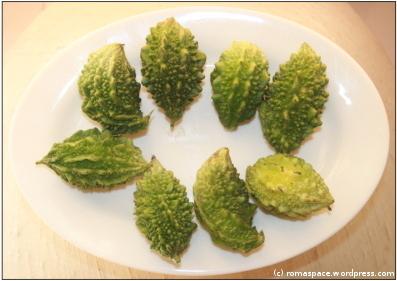 The natural taste of this vegetable is the best and hence it should not contain too many spices. 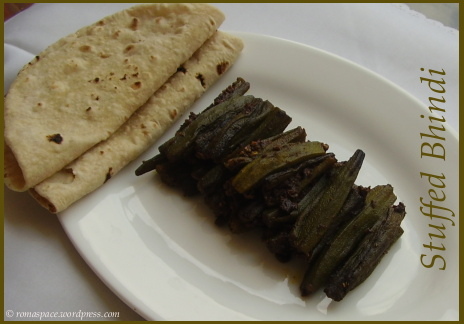 Here is a simple recipe which gives you a delicious Snake Gourd sabzi. Peal away the skin of the gourd well. Cut it into small cubes. Heat oil. Add rai, jeera, curry leaves, slit green chilly and hing. Add gourd cubes, haldi powder, dhania powder, salt and stir well. Cover and cook till done. Once the sabzi is cool add a tablespoon of curds to get a delicious, semi-gravy dish to go with rice/rotis’. This is for all those people who run away at the very thought of eating bottle gourd. Despite its nutritional value we tend to avoid it for its bland taste. 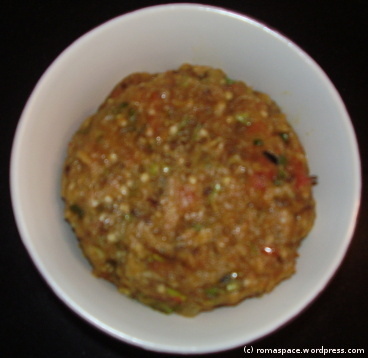 Lauki Ka Bharta is another dish invented by accident. About 6 years ago, I was cooking a meal for myself and my father when my mother was out of town. There was this bottle gourd at home and I simply didn’t know how to cook it. I remember mom telling me that it takes long to get done but I didnt have the patience to wait that long. So lauki ka bharta was created. Surprisingly, it tasted well. My cook these days, makes it with a twist of his own which does justice to the original recipe. Pressure cook lauki. Mash and let it cool. In a kadai heat oil. Add rai, chillies, curry leaves, onions and saute well. Now add ginger-garlic paste and fry for a few minutes. Add tomatoes and fry till they go brown. To this add haldi powder, mirchi powder, dhania powder, salt and the mashed lauki. Since the lauki is already cooked this dish is ready quickly. After the mixture comes together, turn off the heat, garnish with coriander leaves and serve hot with rotis. This is a dish I whisk up every time I have little or no time to make a sabzi. Back in school, I had a Maharashtrian friend whose mom used to make it with only onions and gram flour. Was one of the most delicious dishes I have had. I used to wait for veggies to exhaust at her home so I would get the besan onion delight. Lore has come up with an excellent idea of hosting and event of original recipes. 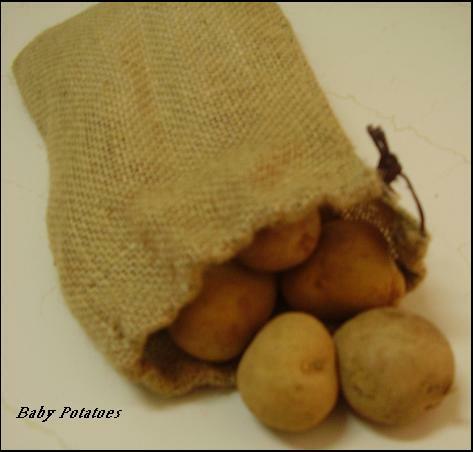 This one is one of my very own creations and I would like to send it as an entry to the Original Recipe event. Thanks Lore, I think its a great concept! The Chillies are basically the big light green pakoda chillies. You need to cut off the head of the chillie. Then slit it in the side and cut it into 2 halves. Separately dry roast the besan till it turns brown. Heat the oil. Add jeera, ajwain, dhania, saunf seeds. When seeds begin to crackle, add the sliced onions. Once onions turn glossy, add the chillies and salt. Cook till chillies are done. Add roasted besan, amchur and continue to cook till besan coats the chillies. The good part about this dish is that it takes less time to cook, so if you want you can substitute the chillies with capsicum or anything else which has cooking time equal to chillies/onions. Amchur should be added towards the end else it delays the process of cooking.